Circa 1904. "Fifth Avenue at Grant Street, South Pittsburg, Pa." The Frick Building at left. 8x10 inch glass negative, Detroit Photographic Company. View full size. Submitted by Alex on Mon, 05/14/2018 - 2:54pm. This is the second time in a few days I notice Pittsburgh being spelled as "Pittsburg". Was (or is?) this a common way of spelling, or is it an often made mistake? Submitted by mitcheja on Fri, 05/11/2018 - 2:37pm. Submitted by Michael R on Fri, 05/11/2018 - 12:01pm. 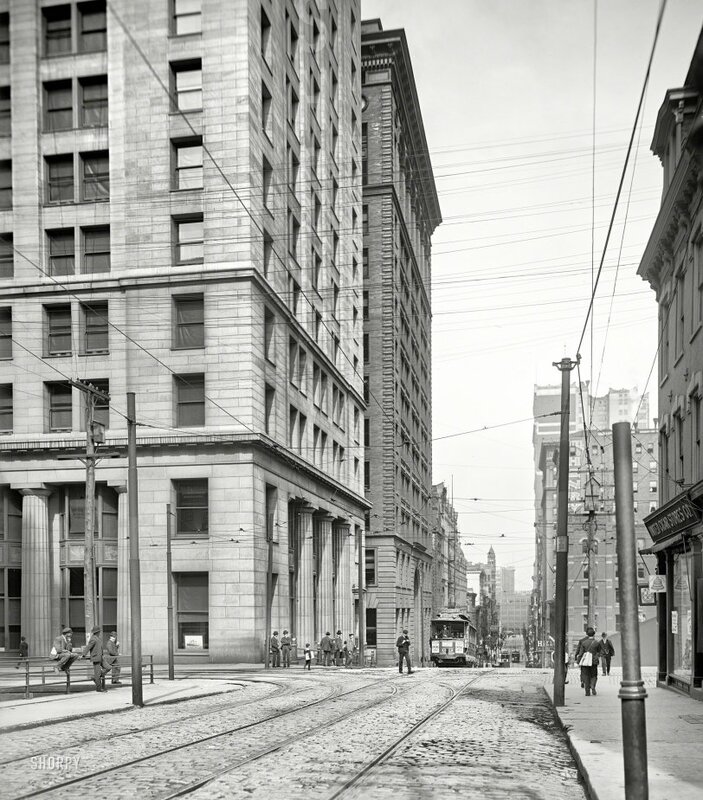 This photograph shows the topographic conditions at this corner of downtown Pittsburgh before the removal of the Grant Street "Hump" in 1912. Today the street grade is one full story (about 16 feet) lower than what is shown here. The basement story of the Frick Building, formerly completely underground, is now exposed, and so is the basement of H. H. Richardson's mighty Allegheny County Courthouse, just out of the picture to the left. The removal of the hump must have improved traffic circulation, but it had very unfortunate effects on the architecture of these two buildings, whose proportions are now thrown out of whack. Is that progress?